Born in Vila do Conde (Portugal) in 1983 and currently living in Berlin. 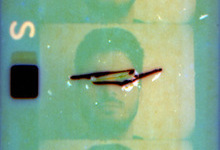 Portuguese filmmaker which works has been presented in several film festivals and galleries like Internationale Kurzfilmtage Oberhausen, Split Film Festival, Rencontres Internationales, Armenian Center for Contemporary Experimental Art, MACBA Barcelona, Media 10/10 Festival, Centro de Arte Moderna José de Azeredo Perdigão, Indie Lisboa and many others. Since 2004 has been developing live cinema concept, manipulating images in real time and interacting with sound. Collaborated with several musicians such as Panda Bear, Lee Ranaldo, Fennesz, Jacaszek, Demdike Stare, Andy Stott, Sandro Perri, Pole, Shackleton, Tropic of Cancer, Porto Remix Exemble, etc. And performed in venues like Serralves Contemporary Art Museum, Sónar Festival, Unsound Festival Krakow/NY, All Tomorrow’s Party, Mutek, Contemporary Cultural Center of Valencia, Berghain, among others venues, film and music festivals.